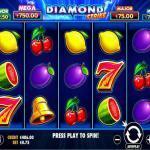 Diamond Strike by Pragmatic Play is a classic fruit video slot machine. Although almost every traditional fruit slot has three reels, Pragmatic Play packs this game with a modern format as it has five reels with fifteen paylines and three rows of symbols. The slot machine has a lot of fruit symbols, and of course, the diamonds that can give you numerous awards. The video slot machine does not only come with a modern setup, as it has state of the art bonuses and features including a Pick Me Jackpot that can give you a reward that can amount up to 1000x the stake. The slot machine is also playable from just 0.15 credits per spin, up to 75 credits and you can enjoy it on a multitude of devices, including mobiles, tablets, and PCs. Diamond Strike by Pragmatic play is a new fruit machine that has five reels with fifteen stake lines. 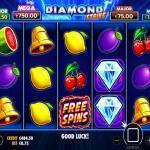 The new slot machine by the developer re-visits a classic theme, which is all about fruits and diamonds. 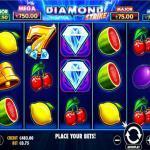 Therefore, whenever you start spinning the reels of the game, you will get a nostalgic feeling as if you are playing on a classic fruit machine as a bar or a land-based casino. 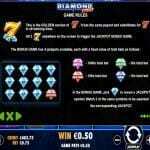 So if you want to experience an excellent experience, in a modern format with updated features, then Diamond Strike is the video slot machine you should be playing. 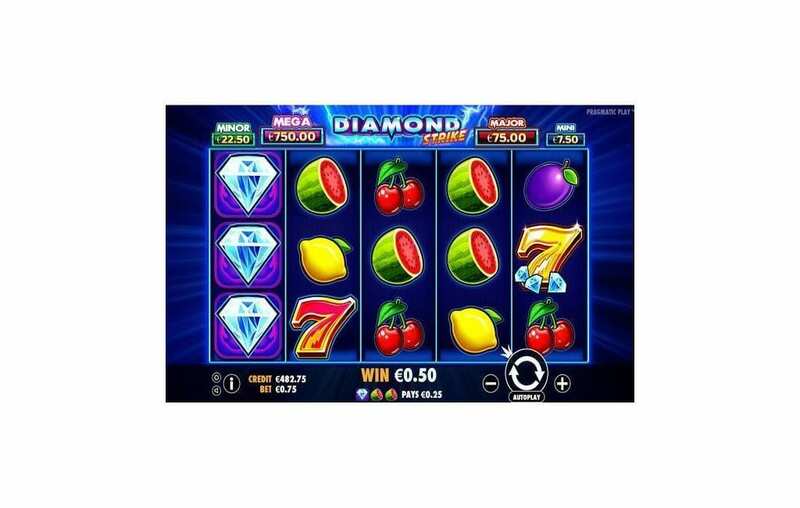 Diamond Strike by Pragmatic Play is a five reel machine that comes with a classic theme that is all about fruits and diamonds, just like the traditional fruit machines we used to play at pubs and casinos. 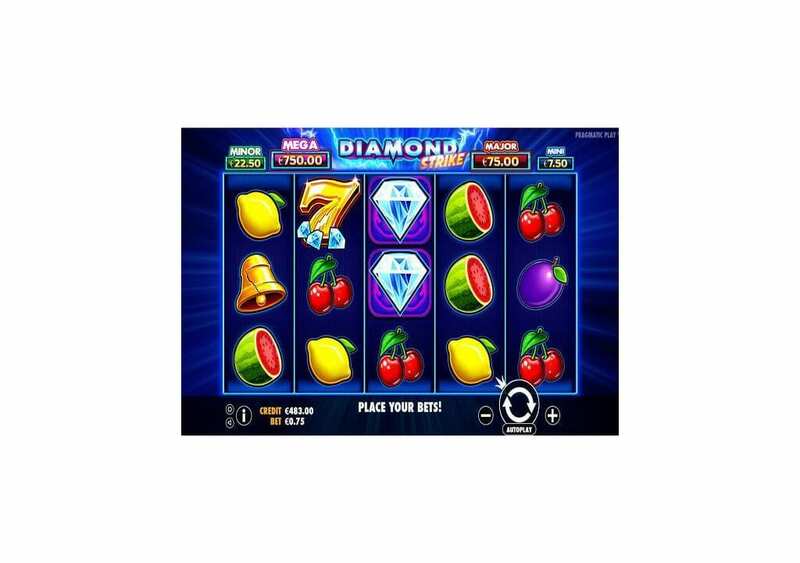 Although the slot machine has a fruit theme, it comes packing a multitude of bonus features and winning opportunities for you to claim during the gameplay. 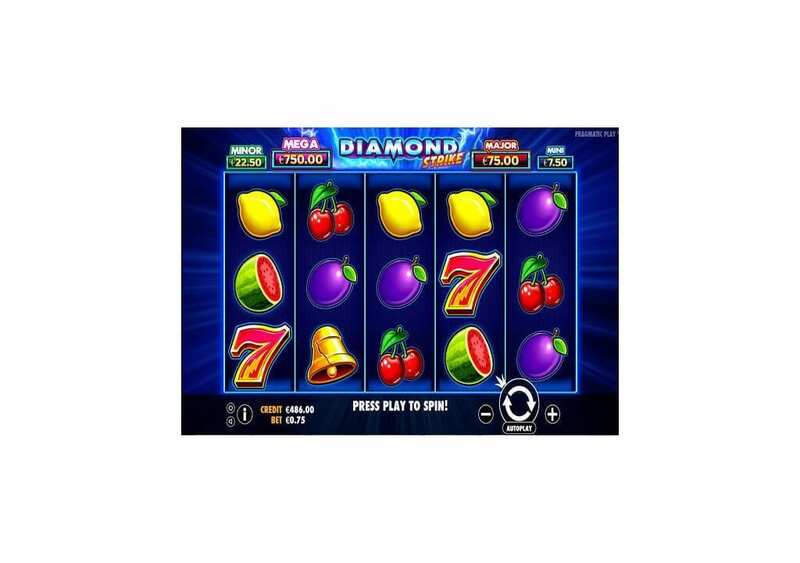 The video slot machine has basic fruit machine visuals, so do not expect advanced 3D visuals and animations. The slot machine has a broad betting range, which makes it quite convenient for novice players as well as veteran high-rollers and you can play it through different devices whether you are using a Laptop, a PC, a Tablet or a Smartphone. 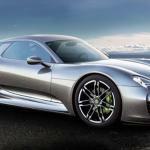 You will be able to give it a test drive here first, to see if you want to play it for real or not. 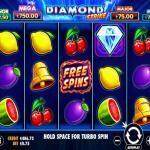 Diamond Strike by Pragmatic Play is a fruit machine at heart, but in reality, it is a modern video slot machine. So you will see that it has five reels, three rows of fruit symbols and fifteen stake lines. On the other hand, all of the visuals and the symbols of the slot machine come straight out of a fruit machine, just like the ones we used to spin at pubs and casinos. The reels of the slot machine have a neon outline and a blue seamless background. As for the symbols of the video slot, they include the diamond, golden 7s, red 7s, golden bells, watermelons, plums, cherries, and lemons. The visuals are classic so that you can expect basic graphics, but do not feel discouraged, as the game is wholly immersive and more importantly, it is highly rewarding. 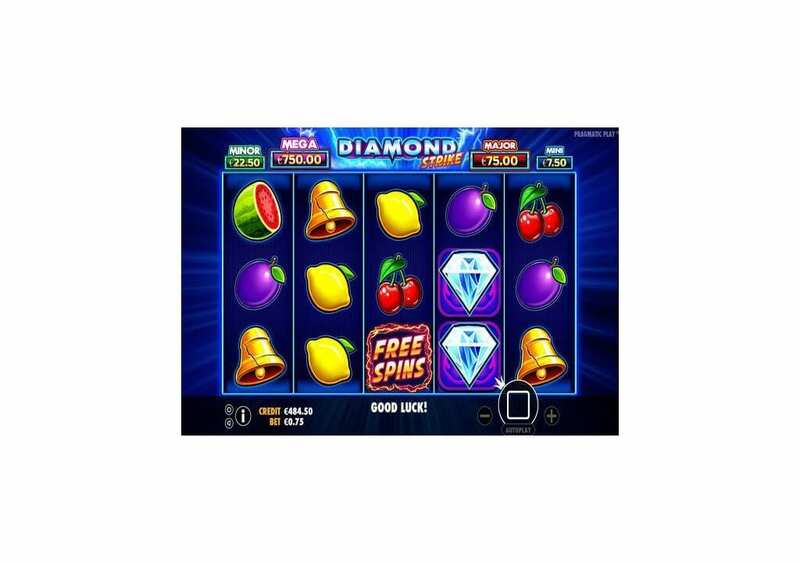 Diamond Strike has a lot of fruit symbols that can result in significant prizes when you match them on the reels. You will need to get a minimum of three matching symbols at least from the leftmost reel to the right. You can check out all of the different payouts that the fruit symbols can give, in addition to the bonus features of the game at the pay table. You will see that the highest payout that you can claim is equal 1500 credits. You can earn that amount when you place the max bet of 75 and get 5x wild diamond symbols on the same line on all five reels. 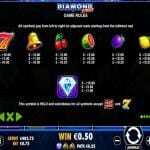 Diamond Strike is a Pragmatic Play video slot, and despite being a classic fruit machine, it comes hosting a great set of features and bonuses that you can take advantage of during the gameplay. For instance, the video slot machine has a wild, free spins and the Jackpot Bonus game. Since Diamond Strike is the title of the game, it makes sense that the diamond would be a unique icon. 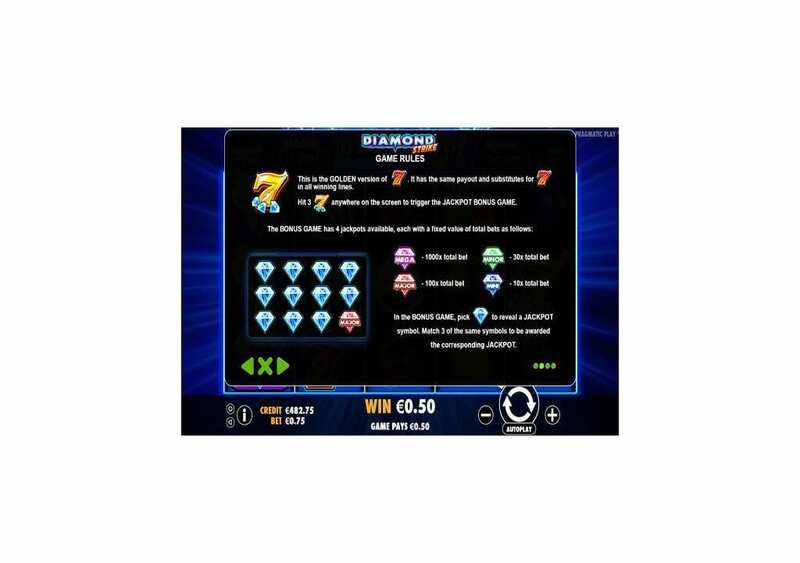 The Diamond is the wild symbol of the video slot machine that is going to substitute for all other symbols on the lines and the reels of the game. The diamond will replace the icon that is going to result in the best and the highest paying combo possible. There are two symbols that the Diamond will not substitute for, and these symbols are the Golden 7s symbol and the Fiery Free Spins. The wild is also capable of triggering line prizes when you match them; in fact, they give the highest line prize when you match fie on the reels. The Golden 7s is the golden version of the regular red 7s, so it can replace the 7s to trigger any winning combos. In addition to that, if you manage to get three Golden 7s anywhere on the screen, you will be able to enter the Jackpot Bonus Round of the video slot machine. The Jackpot bonus game has four different jackpots that you can claim. These values are 10x the bet, 30x the bet, 100x the bet and 1000x the bet. 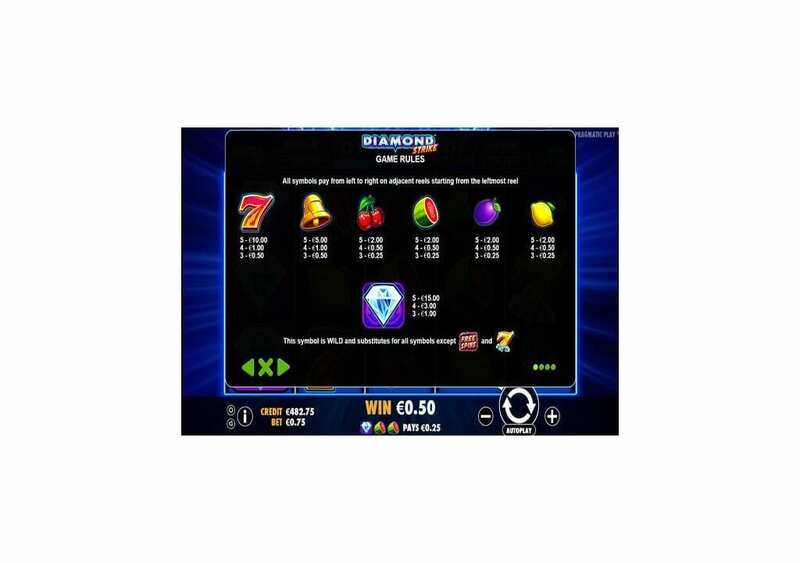 You will go to a second screen that is full of diamonds, and you will click on the diamonds to reveal the jackpot and claim the prize. The Fiery Free Spins is the scatter symbol of the game, so whenever you manage to get three of the scatter icons on reels one, three and five, you will trigger the free spins bonus of the slot machine. You will claim eight free rounds. If you get three more on the same reels, you can earn extra free spins, with no limits. 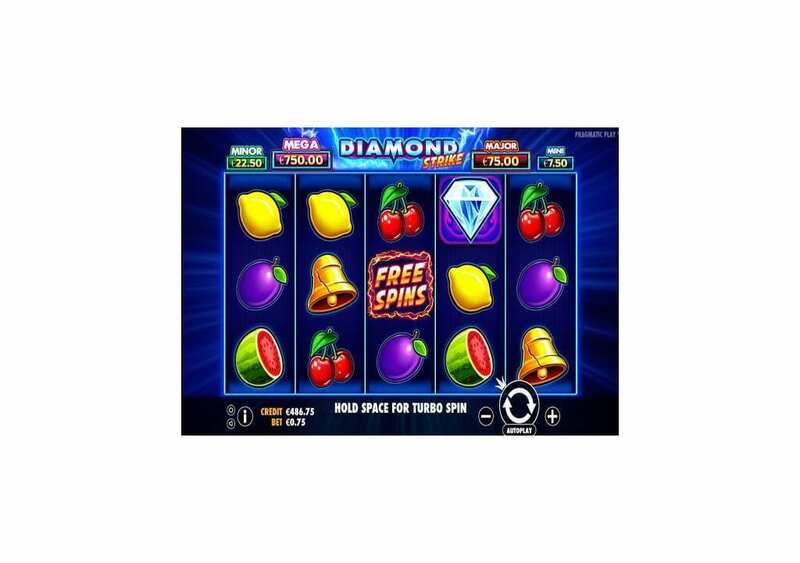 During the Free Spins round, different Reels will be in play with additional diamonds appearing on the reels.